The Asia Pacific region is leading the mobile wallet market with over 90% share in 2017. This is attributed to the increasing proliferation of smart devices and e-commerce platforms. The supportive government initiatives to promote the use of digital payment channels is propelling the use of mobile wallets. The European region is predicted to grow at a CAGR of over 15% during the forecast timeframe. The extensive adoption of the NFC technology in the retail sector has contributed to the market growth. The increasing number of collaborative efforts among the technology players & banking establishments is accelerating innovation in the mobile wallet market in the region. Mobile Wallet Market is anticipated to exceed 250 billion by 2024. The market is driven by the growing adoption of smart devices across various industry verticals. Currently, there are over 2.26 billion smartphones around the world and will account for over 77% of the internet-enabled devices by 2025. This has led the tech players and financial establishments to develop mobile wallets to improve customer experience and enable secure transactions. The changing customer behavior is causing generational shifts and fundamental changes in the way the customers are interacting with their banking institutions. 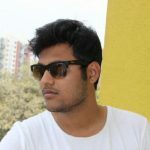 As the millennials (population aged between 16 to 34) are becoming more tech-savvy and hyper-connected, they are preferring to partner with banks, which provide meaningful and personal engagement experiences to their customers. This is encouraging banks to invest in mobile wallet solutions to enhance customer experience. The attractive discounts and cashback offers by mobile wallet providers are fostering the growth of the mobile wallet market. The mobile wallet providers are gaining customer loyalty and promoting repeat purchases among their customers. The rise of multiple e-commerce platforms is also further propelling the use of mobile wallets. As of 2018, approximately 1.5 billion customers have used online shopping channels. By 2020, it is anticipated that the number of online customers will reach over 2.5 billion. The increasing need to buy anything from anywhere across the world is encouraging the use of mobile wallets among online shoppers. The semi-closed market holds over 80% stake in the mobile wallet market. The growth is credited to the influx of tech companies in the mobile banking landscape. The shifting customer preference toward digital technologies is driving the tech companies to invest in mobile wallet technology. The open mobile wallet market is expected to grow at a CAGR of over 15% over the forecast time period. The increasing investment by the banking establishments to launch their own mobile wallets to better compete with the fintech players is promoting the use of open mobile wallets. The tech companies accounted for over 80% of the revenue in the mobile wallet market in 2017. The technology companies, such as Amazon, MakeMyTrip, Uber, and Ola, are developing their own mobile wallet offerings to provide an integrated buying experience to their customers. The device manufacturer market is anticipated to grow at a CAGR of over 20% over the projected timespan. The smart devices are becoming primary tools for procuring goods and services. This has encouraged the device manufacturers to launch their own mobile wallets to monetize the growth opportunities. The banking institutions are investing in mobile wallets to cross-sell and upsell various financial products and services. The NFC market is dominating the mobile wallet landscape with over 70% share in the market. The NFC technology is used across multiple industry verticals ranging from retail to the manufacturing industry. This is encouraging mobile wallets providers to build NFC-enabled mobile wallet solutions. The optical/QR code market is predicted to grow at a CAGR of over 6% during the projected timeline. The inexpensive nature of the optical/QR code technology is promoting its use, particularly in the emerging nations as the merchants in the region do not own POS systems. 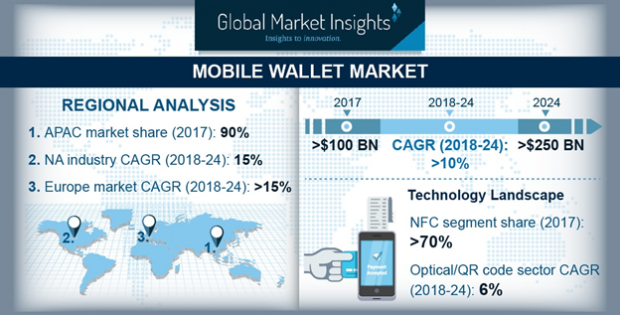 The players present in the mobile wallet market are Apple, Amazon, Google, American Express, One97 Communications, JP Morgan Chase, Well Fargo, First Data, Sprint Corporation, Visa, PayPal, Vodafone, Ant Financial, Skrill, Tencent, Samsung, AT&T, and. Mastercard. In the Asia Pacific region, the mobile wallet market is dominated by the prominent players such as Tencent and Ant Financial. The players in the market are building and expanding its partnership network with merchants, online retailers, and public sector companies to effectively reach more customers and provide them with a high-quality sales & post-sales support experience. For instance, in November 2016, Vodafone partnered with West Bengal State Electricity Distribution Company Limited (WBSEDCL) and Calcutta Electric Supply Corporation (CESC) to allow online bill payments to its mobile wallet users.